I know I need to write a report on my trip to Baltimore, but something happened this evening that I want to share. I am a member of the Montgomery County Coin Club (MCCC). The club holds its monthly meetings on the second Tuesday of each month. For this meeting, Joe Fitzgerald was our speaker. Mr. Fitzgerald is the artist and a member of the US Mint‘s Artistic Infusion Program. 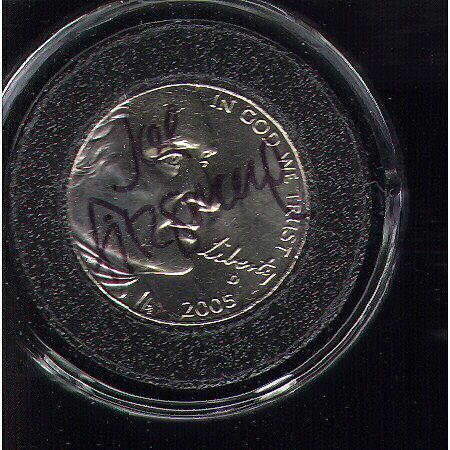 He is the designer of the 2005 obverse portrait on the Westward Journey Nickel and the reverse of the 2005 “Ocean in view!” reverse. Mr. Fitzgerald’s spoke about how he applied for the Artistic Infusion Program and the process that he experienced in creating the new designs. His talk included slides that showed the different designs he submitted and how the design evolved from concept to the final coin. He also explained his thoughts in the design. What I found interesting was that while designing the obverse of the nickel, Mr. Fitzgerald explained that the design was something that he wanted to try but did not think it would be accepted. He said that as part of the design, he wanted to position the word “Liberty” in a way where it looks like Jefferson was speaking. Mr. Fitzgerald also wanted to have Liberty in Jefferson’s handwriting in order to give it life in Jefferson’s character, giving it more meaning. It has always been my opinion that this portrait of Jefferson has had the most character of any presidential portrait that has appeared on any coin. It was a bold move to suggest this design and it was executed with such care that it visually gives Jefferson character and strength to heighten its stature. I wish this design would have been made the permanent design. Unfortunately, the Mint has other ideas. Following the meeting I was able to speak with Mr. Fitzgerald. He is a delightful person and all of the accolades he has received are well deserved. When we finished talking, He pulled an “Ocean in View!” nickel from his pocket and autographed it in front of me. I was so impressed I put it in my wallet between two credit cards to ensure that his autograph would not rub off. At home, I carefully removed the coin and placed it in an AirTite holder. I scanned and offer the image here for anyone to see. Sorry, this coin is not for sale. It will be in my collection until it is time for be to pass it on to my heirs! Thank you, Mr. Fitzgerald for a delightful talk and a wonderful memento of this evening.